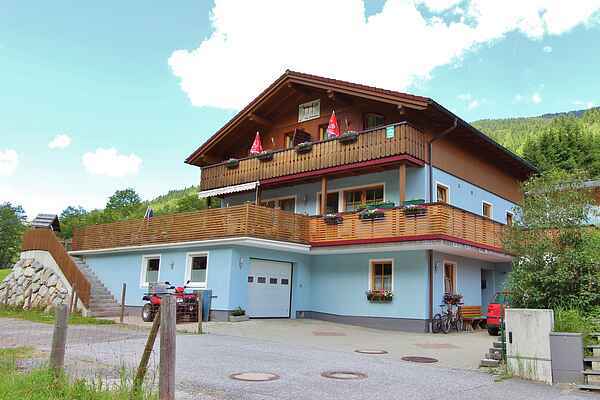 Not too far from the Schönleitenlift in well-known Saalbach, you'll find this beautiful house, situated on the sunny side of the valley. The top-floor of the building houses 2 holiday homes. Your holiday home features a pleasant living room with an open kitchen. The well-kept living room has a dining area and a sitting area and the latter can be turned into 2 sleeping places. The living room provides access to the sunny balcony. There's also a spacious bedroom and a separate bathroom. On the ground floor there's a storage room, which is handy for skis in winter and for bicycles or mountain bikes in summer. If there's enough snow, an experienced skier can basically ski all the way back to the house. Saalbach-Hinterglemm as a skiing destination does not require any further explanation. You won't find more kilometers of ski-slopes so close together anywhere else, and that from early december to mid-April. Cross country skiing, tobogganing, or of course the famous après-ski; you are in the right place in Saalbach-Hinterglemm. During the summer there are plenty of sports and hiking activities for you to do, and you can reach most of the sights of Salzburgerland very easily.